It has been quite some time since I've had the opportunity to review a Montex mask set and this is a good one. 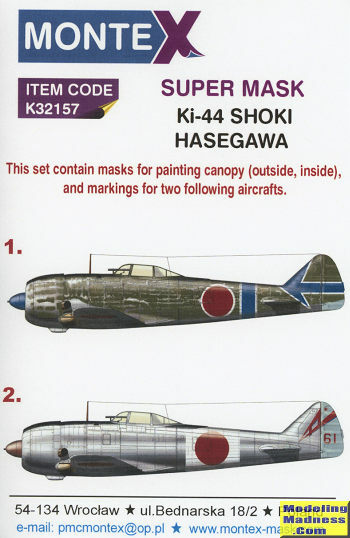 Designed for the Hasegawa 1/32 Ki-44 Tojo kit, it provides markings for two aircraft. The Tojo is a good choice for those who have never used paint masks like this as it is not complex and requires very little in the way of 'layered' masks. In fact, aside from the canopy masks, there are only two sheets. The other is an overall unpainted metal plane with white home defense bands. This one is will the 47th Chutai in the summer of 1943. It has a red tail marking and the mask includes the aircraft number. Part of these white bands are included in the mask set. 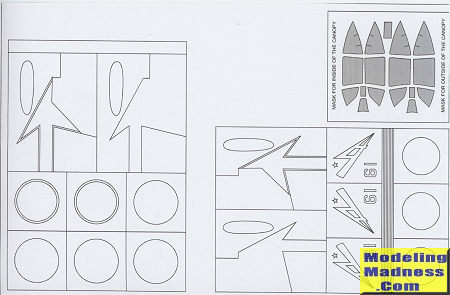 Any stencils will need to come from the kit decal sheet. A set of instructions is provided to help with the proper sequencing. Things I would have liked to have seen included are the wing walkway and the upper fuselage anti-glare panel as well as the aforementioned fuselage band.